Following on from the recent announcement that self-styled “True Norwegian Balkan Metallers” TROLLFEST would be releasing a 12” picture vinyl to celebrate the band’s 10th Anniversary, the artwork for the album has been released today. Long-time TROLLFEST collaborators Swedish Cartoonist Jonas Darnell and designer Terje Johnsen have pulled out all the stops for the picture disc, which illustrates a selection of characters created by Darnell for various of the band’s releases, including the iconic metal duck from the “Villanden” album and the hellhound from the track “Helvetes Hunden Garm” which has been a consistent crowd pleaser at TROLLFEST live appearances. The 16 track album, titled “A Decade Of Drekkadence”, includes a completely new song, three covers, including songs from Tom Waits and Britney Spears, two b-sides and the band’s 2004 demo which has never previously been released, and which has been long-sought after by TROLLFEST fans. 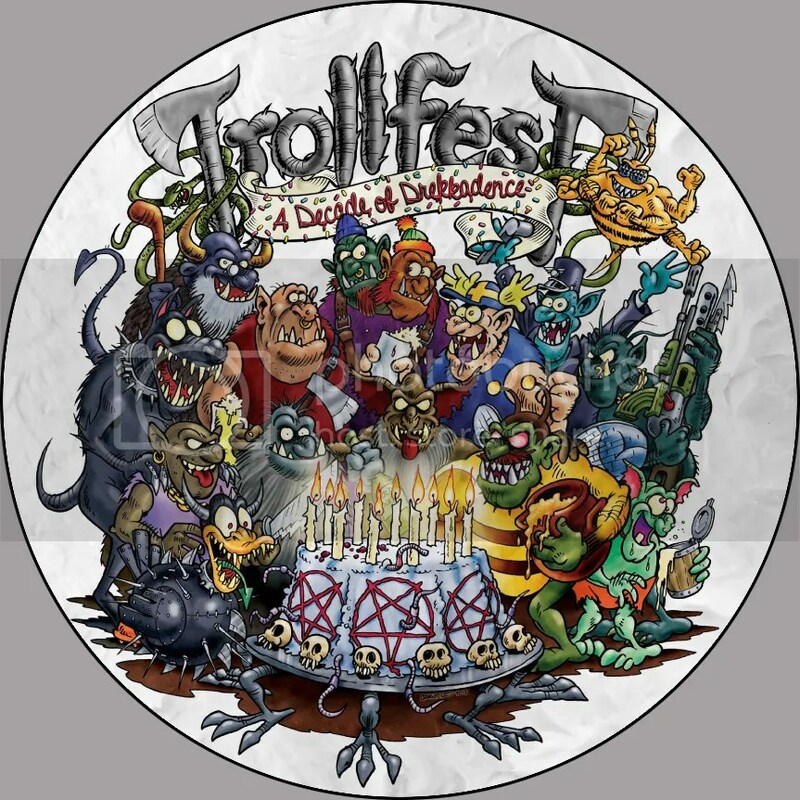 Also included are re-recordings of acoustic versions of three of Trollfest’s signature songs which the band performed during a special acoustic set at MetalCamp 2012. Each picture disc will include an email address that purchasers can contact to receive an MP3 download of “A Decade Of Drekkadence”.